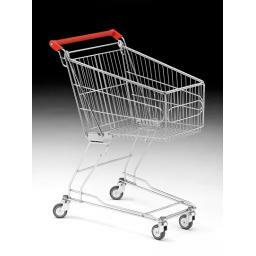 60 litre wire supermarket trolley with coloured handle, bag hook and 75mm diameter wheels. The number one choice in convenience retail stores and small farm shops, the 60L is an excellent small trolley which is highly recommended. 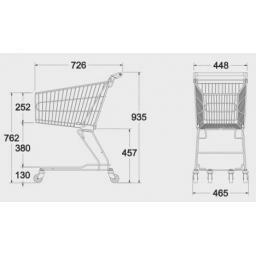 The 60 litre trolley is narrow for smaller aisles, is easy to manoeuvre and is stable when empty and full. The capacity is almost equivelent to 3 hand baskets of shopping making a few available to customer is a cost effective way of increasing spend.